Our PLUS station is plug and train call taking and radio dispatch simulator for training 9-1-1. 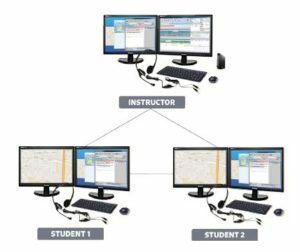 Multiple phone lines, text to 911, mapping, dual radio channels and full documentation of student calls both audio and data. Loaded with video tutorials and a full 911 digital academy and certification. Setup and teaching to zero learning curve for teachers and students. Online join.me training session for all instructors. Click below for a video demo. PLUS includes two advanced features; mapping and text to 9-1-1. This station has internet access using a switch included. Truly plug and train. 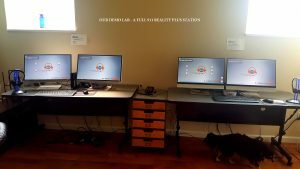 Below is our demo lab PLUS unit setup. One instructor to one student or one instructor to any number of students. Our stations are configurable to fit your needs and space. Our stations are also portable and can easily and effortlessly be transported to other locations for lab training. Created by 9-1-1 professional educators who have taught in the high school and college setting. We understand your need for reliable, zero learning curve, easy setup training station loaded with a full 9-1-1 (10) Academy Curriculum and NECC teacher and student online one time certification. BEST VALUE $29,925.00* One Instructor Two Students (add on up to 5 for quantity discounts. Option: Running Start on site setup and training, contact for costs. **ProQA protocols are loaded onto to the station prior to delivery but are not activated without contacting Priority Dispatch Corp (PDC). Upon delivery PDC must be contacted to delivery a dongle and load on a program called XLerator onto the stations to make the protocols active. Contact sales at PDC to determine any additional costs for installation. Cost $1000 per SEAT and $124 4 hour training for teacher OFFERED. More info here. Lifetime Software – anytime life-of-the-simulator online screen share software support and training. Full 10 Unit 911 Academy digital curriculum and 911 Emergency Communications Textbook v5 loaded on each station with site license for unlimited use. Hardcopy text also sent and can be ordered for students here.